The only bag you need for a fun or romantic time in the Park. 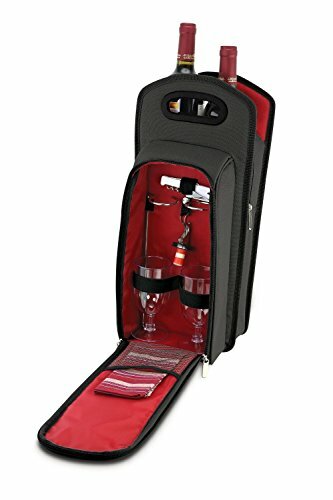 The KOVOT 9 piece wine travel bag and picnic set includes 2 acrylic wine glasses, 2 wine glass stakes, 2 cloth picnic napkins, 1 corkscrew, 1 bottle stopper, and 1 insulated travel bag. Contains a well insulated main storage compartment to keep your wine at the temperature you need, as well as additional Sip pocket in front. This is a great set for an outdoor picnic, day at the beach or just to give any wine lover as a gift. The included wine stakes will stick right into the ground and hold your wine glasses right where you want them. The travel bag dimensions are 17" tall x 8" long x 6" wide. If you have any questions about this product by Kovot, contact us by completing and submitting the form below. If you are looking for a specif part number, please include it with your message.